Hubbard Street's Kellie Epperheimer in Alonzo King's "Azimuth". Photo by Margo Moritz. In 2011, The Joyce Foundation awarded a grant to Hubbard Street Dance Chicago and San Francisco-based Alonzo King LINES Ballet for a multi-year collaboration culminating in a shared program coming to the Harris Theater next week. Hubbard Street will perform resident choreographer Alejandro Cerrudo’s 2012 work Little mortal jump and LINES performs King’s 2007 Rasa. The show ends with the Chicago premiere of the two companies combined in King’s Azimuth. The well-received new work had its world premiere earlier this year in Berkeley, California and will also be presented for one-night-only later this month in Madison, Wisconsin and later this summer in Los Angeles, California. King came to Chicago last year to work with the Hubbard St. dancers and the companies both did a three-week residency last summer at the University of California Irvine. He used all of his LINES dancers and all but two of the Hubbard St. dancers to create a cross-country masterpiece for 28 top-of-their-game dancers. What’s it like working with Alonzo? He is an incredible mind. He has these ideas and is really interested in having the dancers explore the work of what he gives. There’s a lot of freedom, I think, in his movement. You can push yourself and not get too comfortable. He’s a big fan of it constantly changing and morphing and testing your limits to see what happens. I think he asks a lot from his dancers, in a really excellent way. He’s specific with certain things, but how you interpret that is very free, which allows the dancer to put in their personality. How are his dancers different from Hubbard St. dancers? They’re not that different. They are a taller company, for sure. Their bodies can do some amazing things that I can’t. I had hip surgery a couple of years ago, so my legs don’t go up as high as they used to. I think we get low. My initial impulse is to drop my center and get low. It’s been nice to have him test me to be up quite a bit and use that space as well. Did you notice either company changing the way they moved? Did you adopt each others’ style? Absolutely. I think it was a good two-way street. We all were very influenced and inspired by each other. They work with him often, so they know his vocabulary better, but they were really interested in how we were approaching it as well. It was a great experience. It was nice to have a community like that. Tell me about the new work, Azimuth. He did an excellent job of using all of us. It starts out with a large group section. We’re all dancing on stage, but interpreting our own timing and rhythms. We eventually sync up to do another large group dance. The different bodies and dynamics are interesting. We have a couple of sections with duets where we are integrated amongst the LINES dancers. It’s a nice little journey he takes us on throughout the piece with breakout solos and an ebb and flow to it. Hubbard Street + LINES Ballet perform at the Harris Theater, 205 E. Randolph St., Thursday-Sunday, March 14-17. Tickets are $25-$99. Call 312.334.7777 or visit hubbardstreetdance.com. 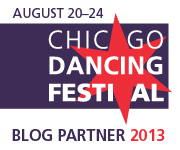 Last week I sat in on rehearsal at Hubbard Street Dance Chicago’s (HSDC) West Loop studios. The well-respected group is prepping for a spring run of shows at the Harris Theater, March 15 – 18. 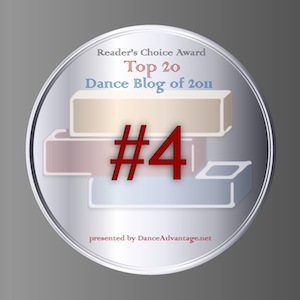 Two of the three pieces they are presenting are audience favorites (and two of my favorites) from last season that pushed the dancers to new limits. Alonzo King’s Following the Subtle Current Upstream takes classical technique and tilts it off balance, skewing lines and testing the boundaries of center. Sharon Eyal’s Too Beaucoup challenges detail, sensory and memory capacity while stripping away virtually any sign of individuality. They are a study in contrast. It’s the third work on the program that proves to be an enigma. 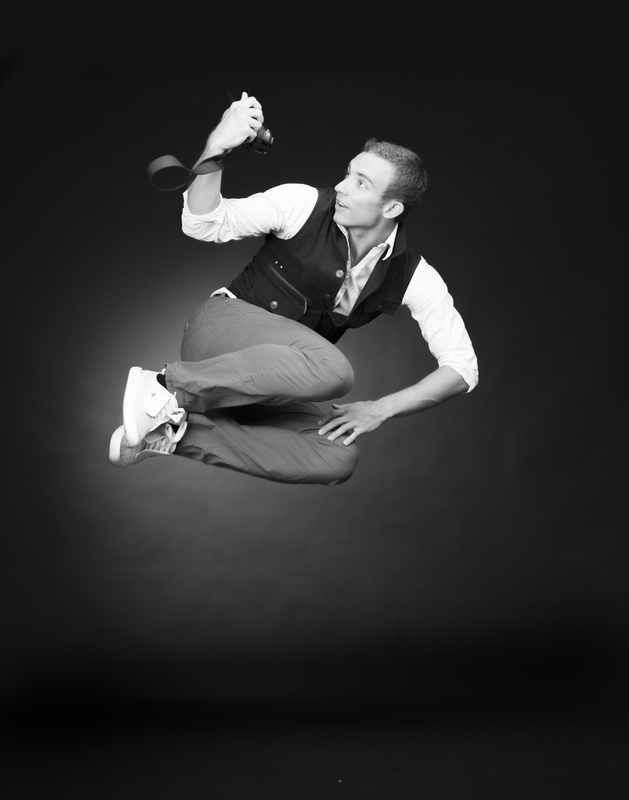 HSDC Resident Choreographer Alejandro Cerrudo, always a man of mystery, presents the world premiere of Little mortal jump at the top of the show. He will then dance in the remaining two pieces. His new work for ten dancers has little bits of his older works Off Screen (2008), Extremely Close (2007) and Lickety Split (2006) and is set to an eclectic score that pieces together a collage of musical ranges from Tom Waits to Max Richter. “I think the piece has a twist,” Cerrudo said before a run-thru at rehearsal. “It starts one way and finishes in a completely different world. I tried to do that as smooth as possible. To me, the mood of the piece starts very theatrical and finishes…more dance, more intense.” Although he begins every new work with a fresh perspective, Little mortal jump shows glimpses of his evolution as a choreographer, while also proving he is a master of both extremes – humorous theatricality to intense beauty. Incorporating interactive set pieces adds an intriguing touch that will surprise all. A duet with Ana Lopez and Jesse Bechard includes a slow-motion sequence that is a tender, private moment in a fast-paced piece. It’s an exciting time for Cerrudo. In late February, it was announced that HSDC’s 35th anniversary season would open with a full-length work by Cerrudo inspired by Marc Chagall’s America Windows at the Art Institute of Chicago. After this week’s premiere, he has a week off then travels to Milwaukee for final rehearsals of Extremely Close, then to set a new work on Aspen Santa Fe Ballet. The rest of the summer will be working on the Chagall piece in the studio. He, of course already is planning it in his head. “I’ll try to make it fun,” he said. “I know what I want a full-evening to look like or feel like, but it doesn’t mean I can make it work that way. I’m going to try my best.” If his past work is any indication, his best will surely delight and enthrall. Thursday, March 15 at 7:30 pm, Friday & Saturday, March 16 & 17 at 8 pm and Sunday, March 18 at 3 pm. 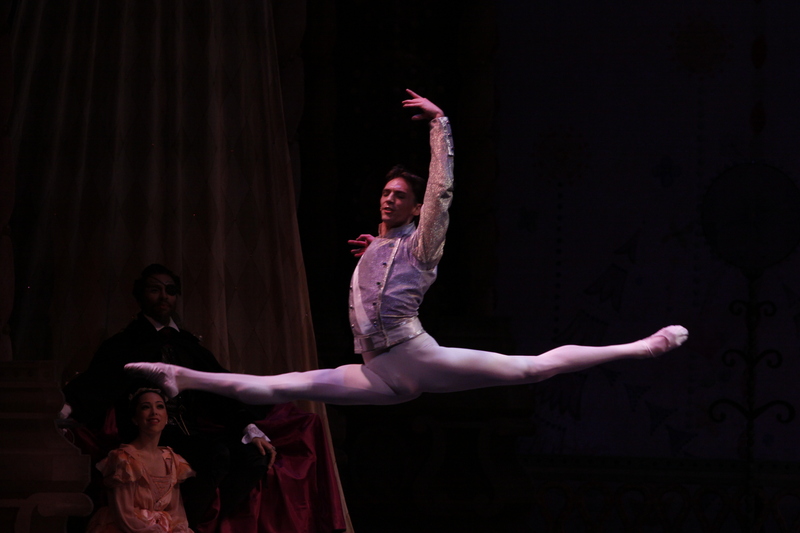 Jonathan Dummar in "The Nutcracker". Photo by Herbert Migdoll. From Reno, Nevada, Dummar began taking dance classes after being invited into his sister’s class by her teacher. She had seen him watching from the window and trying to do the moves. The physical child, who participated in gymnastic, swimming and diving, was hooked. To avoid competition, his mom enrolled the children in different dance schools. His very first teacher, Ava Kerr, basically changed his life. “She was so fundamental,” he says. “She taught me so much. She had me partnering within two weeks.” From there he participated in dance competitions, spent summers in LA at the Edge Performing Arts Center on scholarship, Pacific Northwest Ballet‘s (PNB) summer program and on to The Harrid Conservatory to finish high school. “The training at Harrid is rigorous. It’s boarding/ballet school. They really helped me hone a lot of things and gave me a good base. I’m a completely different dancer now.” After graduating valedictorian, Dummar danced with PNB’s professional division until an ankle injury ended in surgery. 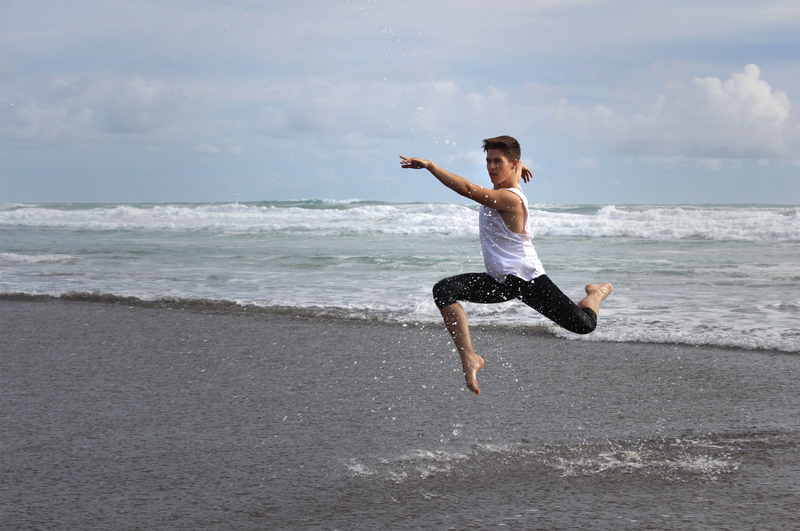 After healing, he danced two years with Ballet Memphis, where he met choreographer Trey McIntyre and became a founding member of the Trey McIntyre Project. Feeling that he wasn’t utilizing his ballet technique fully, he auditioned for the Joffrey and joined the company in 2005. At the Joffrey A Starry Night party after the final show of the season, I approached Dummar having just found out at the performance that it would be his last with the troupe. “You should interview me,” he said. A few weeks later, we sat down to discuss his career. So, why did you decide to leave Joffrey now? I’ve been here for six years. The company is skewing younger and more classical all the time and I’m going in the opposite direction. I’m really thankful for the opportunities that I got. My values are changing and they aren’t necessarily aligned with where Ashley is taking the company. Ashley taught me a lot. He gave me a lot of opportunities. I’m really appreciative and grateful. I feel really glad about what I did, but I can’t wait to start this next chapter. There’s a lot of personal reasons too. I’m from the West Coast. I’ve been away from home for 11 years. I’m ready to be closer to family. San Francisco is like the promise land of the new age. There’s organic produce on every corner, the yoga there is amazing, they compost, they have clean energy…I was so impressed with all of that. It finally feels like I’m finally making a decision for me as a whole person. It’s kind of selfish, but all of the things I’ve done to grow and learn and do what I wanted to do. Now I can take it and share it with my family. Well, I ‘m going to miss watching you dance. What have been some of your favorite pieces at Joffrey? “Round of Angels” has been one of my favorite things I’ve ever performed. The Arpino rep is really fun. You watch it and it’s easy to be critical, but when you do it, it’s so fun…fast and hard. It’s part of dance history. “Crossed” by Jessica Lang. I really liked “Bells” (Yuri Possokhov). When I first joined, Fabrice (Calmels), Val (Robin) and I did Kylían’s “Return To a Strange Land”. We did the pas de trois. It was a very emotional piece. It was a fantastic opportunity. Tell me about Smuin Ballet. Michael Smuin is the former Artistic Director of San Francisco Ballet. He wanted some more artistic freedom and wanted to do some things the board wasn’t in to, so he left and started his own company. He was a Broadway choreographer before he did ballet, so all of his works are more showy, more dancy. He died about three years ago. It was horrifically tragic for the company. He was very much the lifeblood. He died in the studio teaching class of a heart attack. Everyone talks about him with so much reverance. The company is going in a new direction. We’re doing Trey McIntyre, some Kylían, lots of premieres, and a few by Michael Smuin. It’s a smaller company. I know I’ll be more valuable. Some of the ballerinas there deserve a really strong, attentive partner. I have some friends in the company. It was just an overall feeling. I went and auditioned and thought this is where I need to be. It was perfect timing with the Joffrey lock out. I want to direct. I know that’s in my future. I know there’s an intellectual side that I’ll need to cultivate, but I think you can do that with dance. Absolutely. I’ve been to some modern shows and the ideas they present are incredible. Ballet doesn’t even come close to presenting these ideas and I think they can. I think further integration of these disparate kinds of dance is completely possible. I’d love to work with Alonzo (King) at some point. HSDC dancer Jessica Tong in Sharon Eyals "Too Beaucoup". Photo by Todd Rosenberg.